An enjoyable game with some graphic shortcomings. Time travel has been the subject of many science fiction stories and ideas. From H.G. Wells' The Time Machine to today with Shadow of Destiny by Konami. 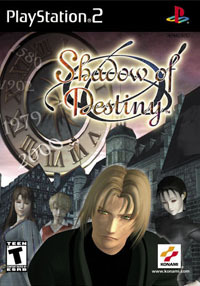 Shadow of Destiny, known as Shadow of Memories in Japan, was brought to us by KCET (Konami Computer Entertainment Tokyo), makers of the acclaimed Silent Hill for the original PlayStation and the upcoming Silent Hill 2 for the PlayStation 2 and XBox platforms. Silent Hill is a very moody game with a very ethereal feel to it, so one expects Shadow of Destiny to be on the mysterious side, and mysterious it is, but in a different way. The story involves the protaginist, Eike Kusch (pronounced 'Ike Kush') trying to avoid his own murder. Many people might think of it as your typical story where the protaginist goes back in time and stops his murder and that's that. This is certainly not the case with Shadow of Destiny. Temporal mechanics has never been this weird, in a video game anyway. You just might find yourself going "Huh?" or "Whoa." in response to the tangled web of timelines and ancestry. Along the road to finding the person responsible for the attempts on your life, you will "die" very often, but you will almost always be given a chance to right the wrongs through different, and sometimes, bizzare means. Locales in the game include, the early 20th century, where everything is black and white, a nice touch by the producers, and also the middle ages, among others. Gameplay wise, this game is not for anyone who likes their action games with actual action in them, as the game mainly involves Eike walking around the psuedo-European cityscapes talking to people and investigating shops. The game plays out like an interactive movie, the only real pressure in the game is doing everything needed before "the fated hour" arrives, at which point the game will be over. The game is rather short and can be completed in 3-4 hours and less your next times through. The other times through I speak of are the main replayability draw of Shadow of Destiny. There are alternate endings to the game that depend on choices you make during certain points in the game. A percentage-based system is put in place for each chapter to grade how much of what you could have done in that chapter was actually done. The game is presented in English only, which is a let down especially since the game is on DVD format and an added Japanese language track could have easily been added. The Japanese version of the game has both Japanese and English language tracks, which leaves me to wonder why Konami of America would omit a language track. Regardless, the english voice over is well done and the english voices didn't detract from the game as often happens when games are localized poorly (ahem, SCEA). The music offers a good backround to the clandestine theme of the game, but is nothing too special compared to the musical brilliance behind KCET's Silent Hill. It is effective nonetheless and does have it's moments. Graphically, Shadow of Destiny isn't revolutionary and reflects a first generation game on the PS2, which it is. The landscapes are detailed, but some of the backgrounds can be bland and lifeless, and some can even be mistaken for a PlayStation job. The character movements were motion captured for that added realism, though when Eike is walking or running through town, he can seem a little stiff. It's graphic shortcomings aside, Shadow of Destiny is a very enjoyable experience that beckons players into a world of mystery and otherworldly experiences. If you enjoyed Silent Hill, then you should give Shadow of Destiny a try. I'm glad I did.